It’s important to keep your dryer clean to ensure optimal performance and energy efficiency, as well as keep your family safe. As with anything, please read your manual before beginning. If your manual gives specific instructions, follow them as they were written for your specific machine by the people who made it and want it to perform at its best. 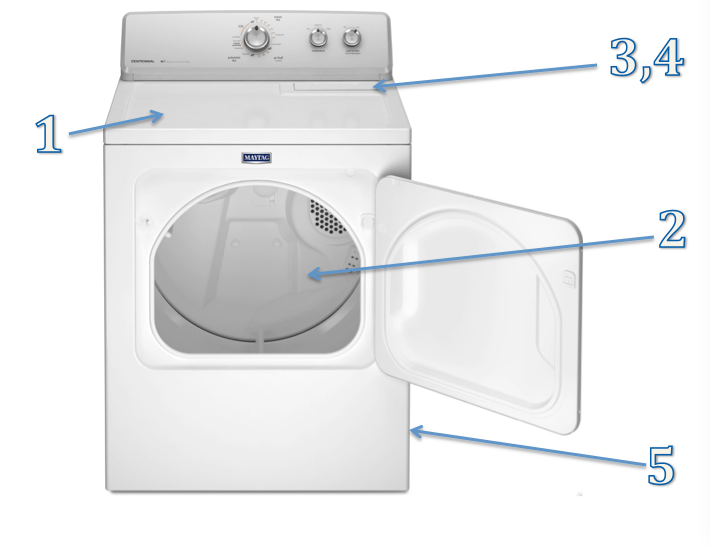 If you don’t have your manual, find the model number on the edge of your door and find it online at http://laundry.manualsonline.com/manuals/device/clothes_dryer.html. Wipe down the outside of your dryer with a soft, damp cloth. To help protect the exterior of the dryer, don’t place sharp objects on it and wipe up any spills immediately, as some products can damage the finish of certain dryers. Wipe down the interior of the dryer, the tumbler. The product you use will depend of your particular dryer, so check your manual. In general, you can use a mild dish detergent and warm water or an all-purpose cleaner on non-stainless steel tumblers. Be sure to get all the crevices like around the paddles and seal. Rinse with a wet sponge or rag. Next, dry thoroughly with a microfiber towel. For stainless steel tumblers, use a stainless steel cleaner and a damp cloth. Then, use a clean cloth to remove the cleaner residue and to dry. If applicable, wipe down the door seal with a damp cloth. Remove the lint from the lint filter. Check to be sure it will allow air to pass by taking it to a sink and running water through it. The water should pass through relatively easily. If it doesn’t, soak and scrub with degreasing dish detergent, like Dawn, and a toothbrush. Be sure to let it dry thoroughly before reinstalling it. Build up on the lint filter is most commonly caused by fabric softener and dryer sheets, so to save time and energy and keep your machine performing at its best, consider leaving those items out of your wash routine. Inspect the lint filter area for lint and foreign objects. Use a vacuum hose with a crevice tool attachment to be sure you get everything. Inspect the dryer vent ductwork inside and outside for lint buildup once a month. Vacuum the ductwork at least once a year. This may warrant a professional, depending on your particular ductwork. It is very important to remove (and prevent) lint buildup, as the heat from the dryer can cause the lint to catch fire. This is a common cause of house fires.